"The committee has met and finalized its recommendation to keep the book on the district's summer reading list and in the school media centers." Will parent Douglas Berry appeal the decision with the school board? We'll keep you posted. 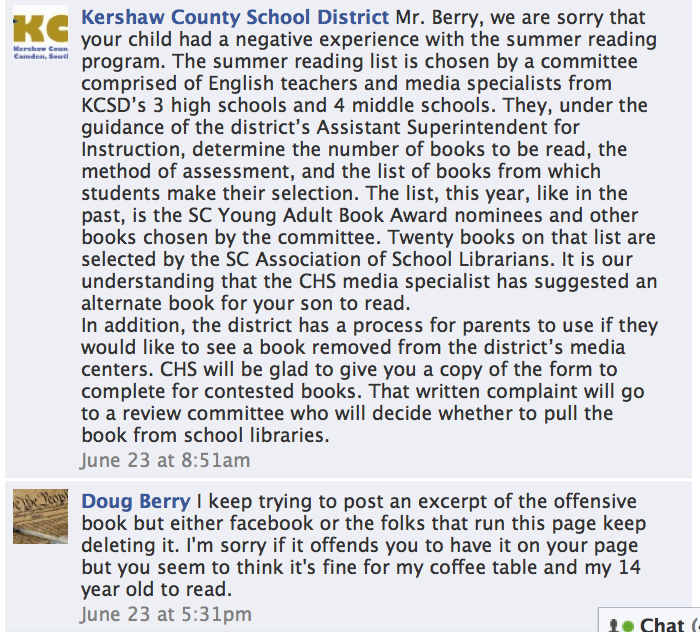 In Kershaw Country, South Carolina, ANGRY MANAGEMENT was "temporarily" pulled from the KCSD summer reading list and all school library shelves earlier this month. 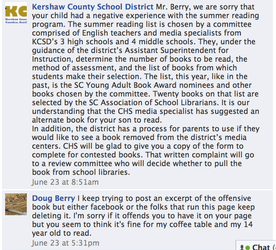 One parent, Mr. Douglas Berry requested the book be banned on Thursday, June 23, according to newspaper reports and the KCSD Facebook page (see below) and by Monday, Jun 27 he said it had been removed and he'd focus on "fixing" the educational system to be sure other books with "language" would be removed. He was not content to control his 14 year old son's reading, he wanted to control what all high school students in KCSD could read. Chris Crutcher responded with a statement to those high school readers that ran in the local paper, along with an interview. He also sent five copies of ANGRY MANAGEMENT to the local Kershaw County Public Library (wristbands will follow for SC teens who care to protest Mr. Berry's action). The ban appeared to be permanent in early newspaper reports, but subsequent television reports suggested it was temporary and a selection committee would be formed to decide the book's long term fate. That committee and its results are not yet determined. To read Crutcher's response, click HERE! 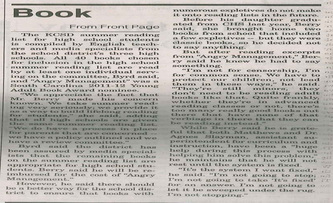 To read the newspaper and television coverage, click HERE. Read -- PLEASE -- Librarian Cathy Jo Nelson's brilliant response HERE. And enjoy this letter from a local South Carolina educator to Mr. Crutcher. She approved the website disclosure. "Thank you! I just want to thank you for drawing so much attention to Chris Crutcher's book Angry Management. The book was already on my 'to-read' list but not at the top because I had other selections that I was obligated to read. Because of the ruckus that has been stirred-up over the book I moved it to the top of my list. I just finished the book a few minutes ago and was moved to tears. It was one of the most AMAZING books I have ever read! I can't wait to recommend it to each and every high school student and adult I encounter. Thanks again for the publicity that you created - this book will change lives." 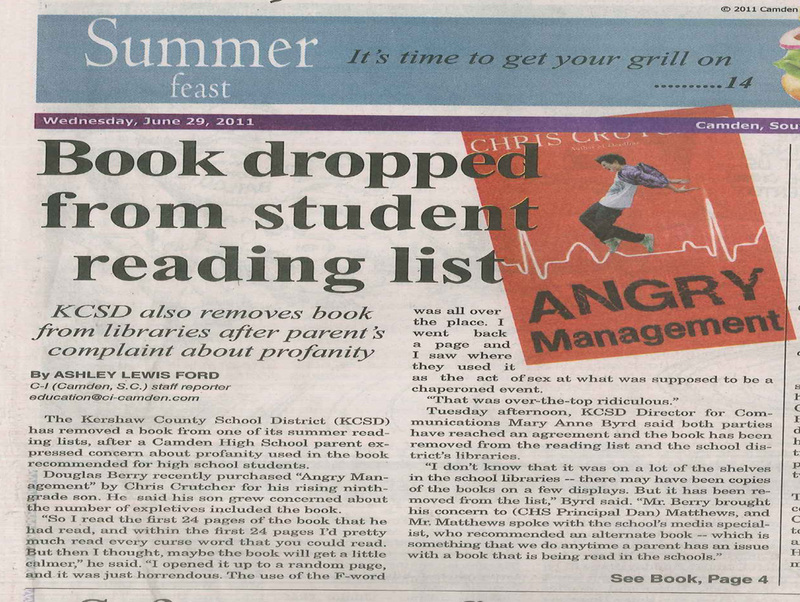 My name is Chris Crutcher and I’ve been informed that my book, Angry Management, has been removed from your summer reading list because a concerned parent, Douglas Berry, brought the “number of expletives” in the text to the attention of your district’s Director of Communications. So the book is off the list and now you’re all safe. I’m sending five copies to your local library just in case you don’t understand that this is the United States of America and a book can’t be banned; it can only be taken out of the one place it should be safe to discuss hard stories that are told in hard language. (Mr. Berry said he read the first twenty-four pages and there was “about every expletive you could read”. Not only was that not true, there isn’t even every expletive I –or you - know.) 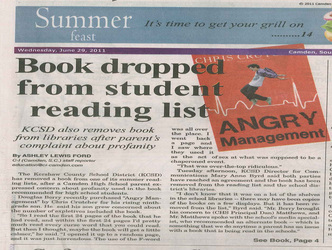 I didn’t write the book to fill it with “expletives”, I wrote it to reflect the lives of the characters. Your schools have a policy of recommending an alternative book if either a student or a parent is offended in some way by the content, and this is a summer reading list, so there are alternative books all over the place. This is about choice. I’m sorry your school district doesn’t have the courage to tell Mr. Berry that while he has a right to monitor what his own child reads, he does not have that right for the rest of the students in the district, and that smart, trained professionals – educators - shouldn’t be undermined in their work because one man has a rigid philosophy. And I’m sorry the members of your community who don’t agree with him, don’t let the school district know it with the same passion he has. But bottom line is, if you want to read the book, you can read the book. 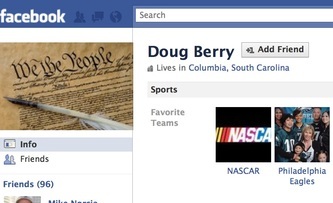 Mr. Berry didn’t read the book; he doesn’t know what “these ways” are. One story is about friendship under very harsh conditions, one is about standing up to authority for one’s beliefs and the third is a testament against bigotry. Someone, maybe the school district, might want to question his real motives. 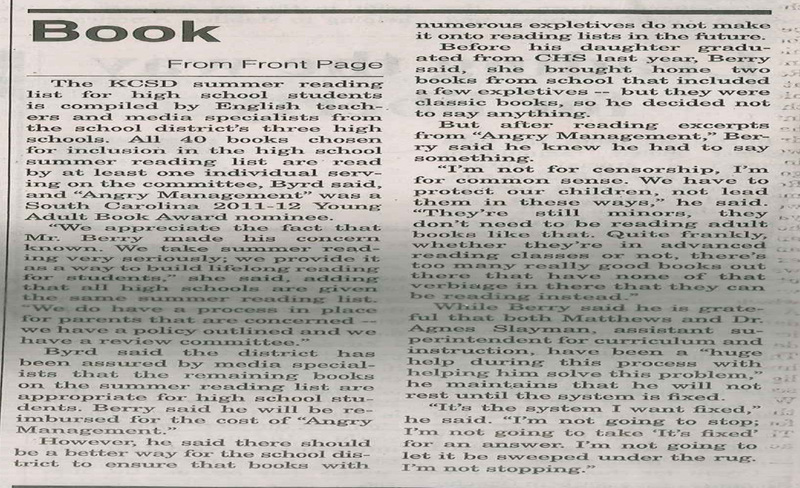 Mr. Berry also said he wasn’t going to stop until the system is “fixed.” Well if your educators are going to allow it to be fixed in the Berry way, the first thing they should do is determine that none of my other twelve books are in the schools’ libraries because none of them will pass his test. Then get Walter Dean Myers’ Fallen Angels out of there, Robert Cormier’s The Chocolate War, and Sherman Alexie’s absolutely stunning National Book Award winner, The Absolutely True Diary of a Part-time Indian. I could go on naming books and authors, but if Mr. Berry is as diligent as he sounds, he’s already reading. 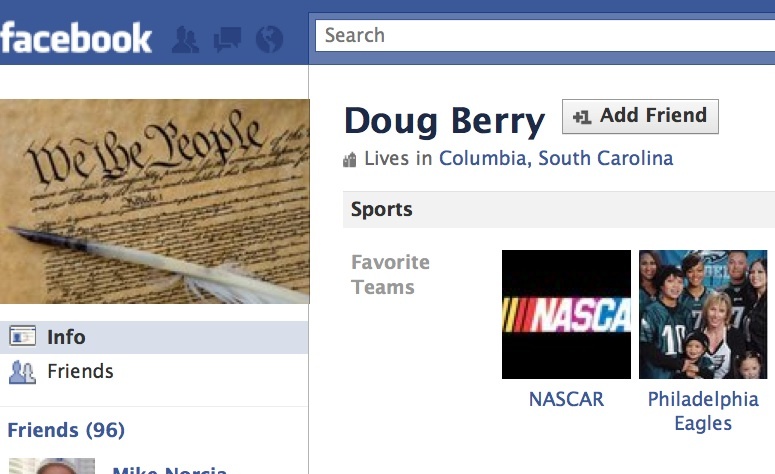 If I were you, the students of Kershaw County, I’d want to know how Mr. Berry pulled this off so easily. He’s right, you are minors, but that just means you’re under the age of eighteen. It doesn’t mean you can’t have intelligent discussions or make good choices about which paths to follow. And it doesn’t mean he knows better than your parents, or more importantly, you. I’d stand up as a group and let people know who you are. If they knew you, if they knew what was going on in your minds, they wouldn’t be so quick to make decisions for you, that you are perfectly capable of making for yourselves. 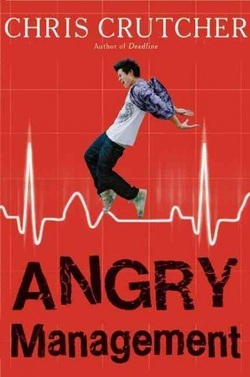 Listen, if you pick up a copy of Angry Management and read the first twenty-four pages, as Douglas Berry says he did, and you don’t like it, put it down. The right to read also includes the right not to read. But remember it’s your right, not anyone else’s. If your education doesn’t challenge you, doesn’t take you out of your comfort zone and even scare you a little, you are being cheated. Wishing you all a good summer. Don’t spend all of it reading. There are great experiences to have. For a closer look at the Chronicle-Independent article text, click HERE.